For adventurers looking for a relaxing escape, consider exploring the diverse wonders of a geothermal pool. 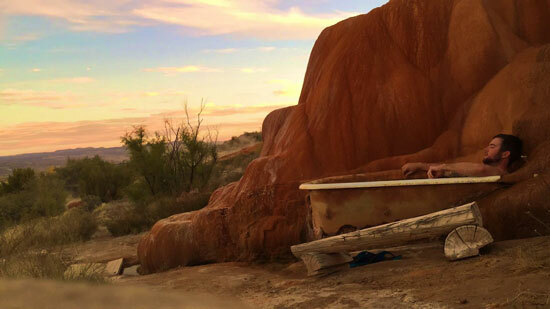 Natural hot springs heated by the earth can be found throughout Utah and offer many holistic healing benefits including increased blood circulation, reduced stress, and natural pain relief. Enjoy the surrounding scenic beauty as you soak in the warm embrace of the natural waters. We found 10 hot springs located within one to four hours away from Cedar City ranging from resort style to backcountry experience. There’s something for everyone to enjoy. Perfect to take the family for a fun weekend, Veyo Pool is a resort-style hot spring, with a natural spring-fed swimming pool, campground, opportunities for catching crawdads, and an outdoor climbing gym. Groups are welcome to bring their own food and picnic, or a snack bar is also available. Climbing opens April 1st and the pool opens May 1st. Getting there: From Cedar City, take the I-15 S towards St. George. Take exit 5 for Dixie Dr, and merge onto Hwy 18 N. In 15.5 miles, turn right onto E Veyo Resort Road. Though it is technically in Nevada, Panaca Warm Springs is just over an hour drive from Cedar City. Fed by a spring coming out of the hillside, the pond temperature stays around 88℉ making it perfect for late Fall and early Spring. The pond has two ladders on either side to make entrance to the pond easier and the water is crystal clear. Getting there: From Cedar City, head west on 200 N/ UT-56 for 59 miles until you reach the Nevada border. Continue west as the road turns into NV-319. In about 20 miles, you will reach the town of Panaca. Turn right onto 5th street and continue north, the hot springs will be on your right. Just an hour and a half away from Cedar City, west of Fillmore, lies Meadow Hot Springs. These springs are located on private property, but the owner lets anyone come and take a dip for free as long as visitors respect the land. Visitors can drive up just 100 yards short of the first pool, so it is easy to spot. There are three pools, all of which have very clear, deep beautiful water. On fall weekends, the place can get a little crowded, but go during winter or on a weekday and you may just have the place to yourself. Getting there: From Cedar, take the I-15 N until the Meadow exit 158. Turn right at the stop sign and drive through the town of Meadow. In about 1.5 miles there will be a unmarked dirt road on your right. Take this back under the freeway, staying on this road until it ends just short of the springs. This spring requires a little bit more work to get to. Located at the end of Fat Man’s Misery just outside of Zion National Park, this route requires canyoneering through the canyon to reach where the spring cascades down the canyon wall. Therefore, it is not suitable for those with no technical skills. The spring falls from the towering walls near the end of the canyon. While it doesn’t have a soaking pool, hikers can still shower under the warm fall. Although the actual canyon is outside of the park, the approach starts inside Zion National Park. There is no permit or fee to go through the canyon, but there is an entrance fee to enter the park. Getting there: From Cedar City, head east on W Center Street. Continue as the road becomes UT-14 and turn right on US-89 S in 35 miles. Follow US-89 for 22 miles, then turn right onto US-9 W. You will reach Zion National Park in 13 miles. 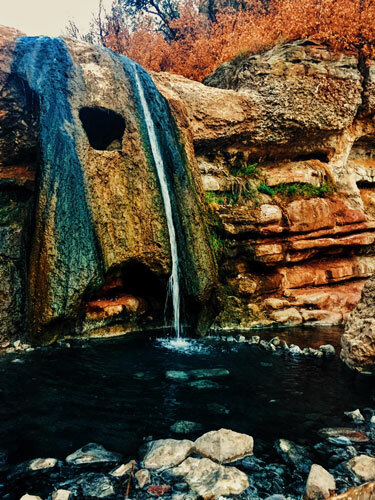 Mystic Hot Springs can be found in the town of Monroe, just a short hour and a half drive from Cedar City. A trip back in time, the small resorts houses a few permanent residents, and campers and their dogs are always welcome. The resort has two social pools and five singular bathtubs for soaking. The minerals in the water have built up beautiful rock formations that spill into the tubs and pools. Cabin rentals, RV sites, tent sites, and backpacking sites are all available to make a little adventure into a relaxing escape. Getting there: From Cedar City, merge onto the I-15 N. Drive for 70 miles, then take exit for I-70 towards Denver. In 25 miles, take exit 25 towards Monroe. Once in Monroe, turn left on S Main Street, then turn right onto E 100 N and Mystic will be at the end of the road. This little hot springs is located just north of Delta, so a little closer to civilization than its neighbor, Gandy. The spring is shallow and has Yellowstone-like formations from the minerals in the water. Surrounded by knee high grass, the rising steam off the crystal clear water makes a picturesque scene. Watch young children around this area, the springs can be a little difficult to see and are extremely hot. Because of their extreme temperature, the locals have created tubs just 200 yards downhill from the spring, where visitors can control the temperature by letting water in from a cool water source or the spring. Each tub can fit several people and make for a relaxing experience. Getting there: From Cedar City, take the I-15 N for 99 miles until you reach exit 158 for Meadow. Follow UT-100 for 12 miles, then turn left onto the US-50. In 13 miles, turn left to stay on US-50 for 3.6 more miles. From there, turn onto the US-6 and continue for 10 miles. Turn left onto the UT-174. Head west for 18 miles then turn right onto the first road you come to, the only one with a stop sign. The springs will be about 7 miles down the road on the right, look for willow. A short hike in the Wasatch just an hour away from downtown Salt Lake City. Depending on the time of year, the hike will be from 2.5 miles in the summer to around 7 in the winter. One of the most picturesque springs in Utah, the trails weave through the forest and over streams until reaching the soaking pools. As you get closer to the springs, the water in the creeks begin to turn a more bright blue and sulphur can be smelled in the air. There are three pools and a waterfall, the pools closest to the waterfall will be the hottest. Because of this trail’s accessibility, it can become crowded on weekends so head out on a weekday or early in the morning to enjoy some solitary time in nature. Getting there: From Cedar City, take the I-15 N for 198 miles. Take exit 257 A-B for the US-6 E. Continue on US-6 for 10 miles, then turn left onto Diamond Fork Road. In the winter this is where the road closure will begin and you will need to park here to start your hike. During summer, you will drive up to the trailhead for the 2.5 mile hike. Crystal Geyser can be found in Green River just off the freeway. It doesn’t have a pool to swim in, but the geyser goes off at random intervals and the minerals have led to beautiful rock formations. It is perfect for a quick trip with friends or family and recommended if you’re driving through Green River. Getting there: From Cedar City, take I-15 N for 73 miles. Take exit 132 onto the I-70 towards Denver. Follow I-70 for 164 miles until you reach Green River. Take exit 164 for UT-19 and turn right onto Main Street, then turn onto BLM 325. Turn onto Little Valley Rd and the geyser will be on the left near the banks of the river. A much more remote location, Gandy Warm Springs is located near the Nevada border by the town of Delta. Gandy lies in the shadow of Spring Mountain, which harbors some hidden treasures. The springs lie south of the mountain and tucked away within them lies a cave. Beware the cave is not large, and requires ducking your head almost completely underwater to access the main chamber. Explore with caution, always make sure to have the correct gear, such as helmets and headlamps. Never explore alone, the currents can be strong through here and it is easy to bump your head on the ceiling. Don’t forget there is plenty of fun to be had outside the cave soaking in the warm water. Camping is an option around the spring and Great Basin National Park is a short drive away. Getting there: From Cedar, follow North Main Street toward Enoch. Continue on this road as it turns into UT-130. Follow this road north for 37 miles. Once in Minersville, turn left onto UT-21 W/ W Center Street. Continue for 76 miles until the town of Garrison. Turn right onto UT-159 and follow this road as it turns into Gandy Road for about 30 more miles. At the sign for Gandy, turn left. In about 2.5 miles, turn right again and follow this slightly bumpy road to the parking area. This resort-style hot spring is located in Midway, and offers one of the most unique experiences on the list. True to its namesake, Homestead Hot Springs is inside of a crater. You can soak in 90-96℉ water, inside of a natural crater. The resort also offers scuba diving, snorkeling, and even paddle board yoga. There has been a tunnel built in the side of the crater so that visitors can come in and out without having to rappel down from the skylight at the top. Getting there: From Cedar City, take the I-15 N 204 miles to Exit 263 for US-189. Follow US 189 for 25 miles, then turn left onto UT-113. 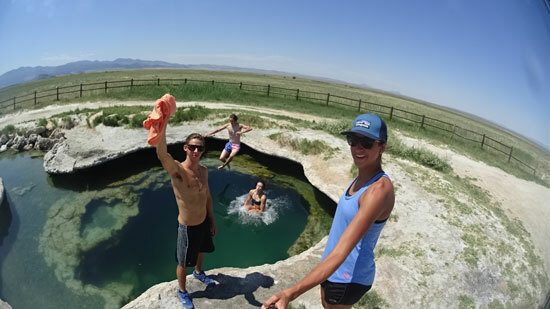 In 4 miles, turn left onto W 100 S.
Have a relaxing adventure, but don’t forget that these hot springs are often times maintained by local volunteer efforts. Be safe, respect other visitors and please leave any place you explore better than you found it.